Just now, after all these years, I am beginning to acknowledge and appreciate my personal style in the art of my quilting. I will call this style “more is more”, in contrast with the old adage “less is more”. I began to develop this style early, starting back when I discovered Roberta Horton’s book Calico and Beyond: The Use of Patterned Fabric in Quilts. 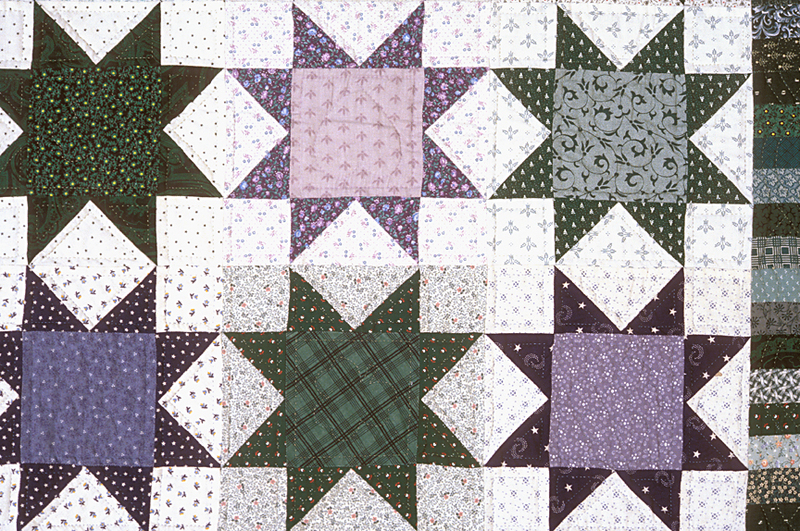 Prior to reading Roberta’s book and doing the exercises in it, my quilts were simpler. 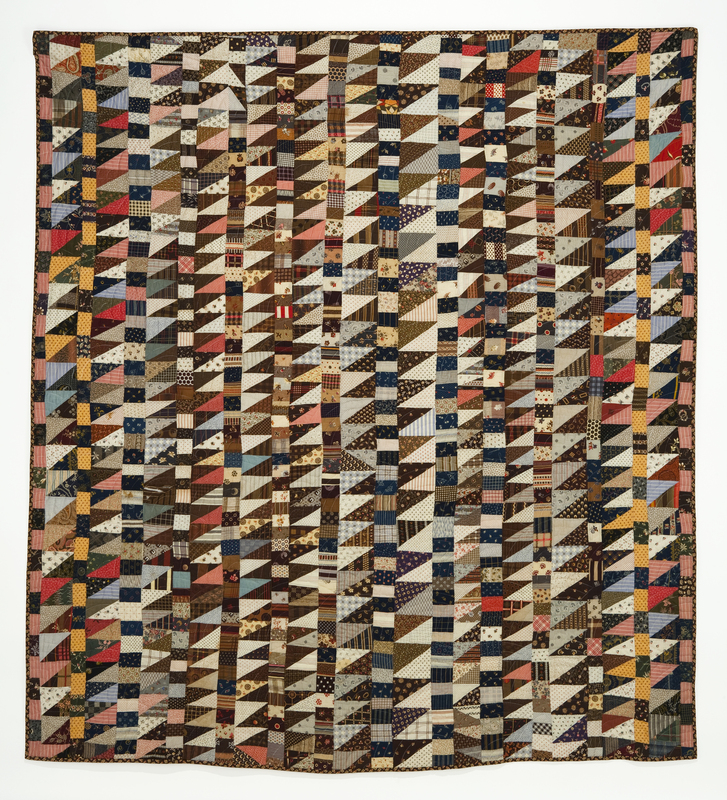 Here is a quilt that is an example of the earlier quilts I’m talking about, a quilt in which all the patterned fabrics are bordered in plain muslin. I remember searching for just the right muslin. Oh, how things have changed. 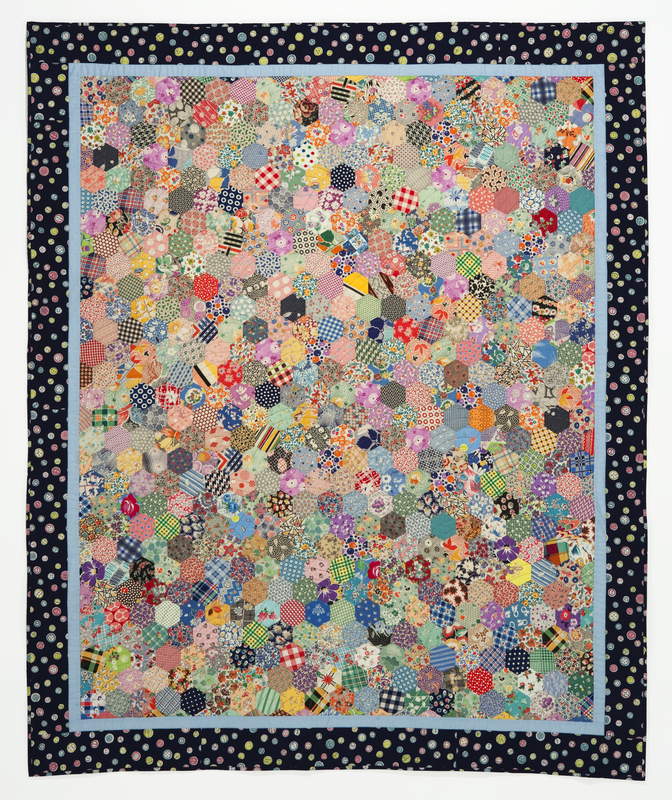 This quilt won a blue ribbon at the California State Fair in 1989, and I remember being hugely pregnant with my daughter Maggie when we drove up to Sacramento to put it on display at the Fair. The motivation for this quilt was making a quilt for myself. Previously I had given away as gifts many of the quilts I made. I also wanted to make a whole quilt from fabrics I already had in my collection. Guess I was playing games and solving fabric puzzle problems even then, challenging myself in this way. 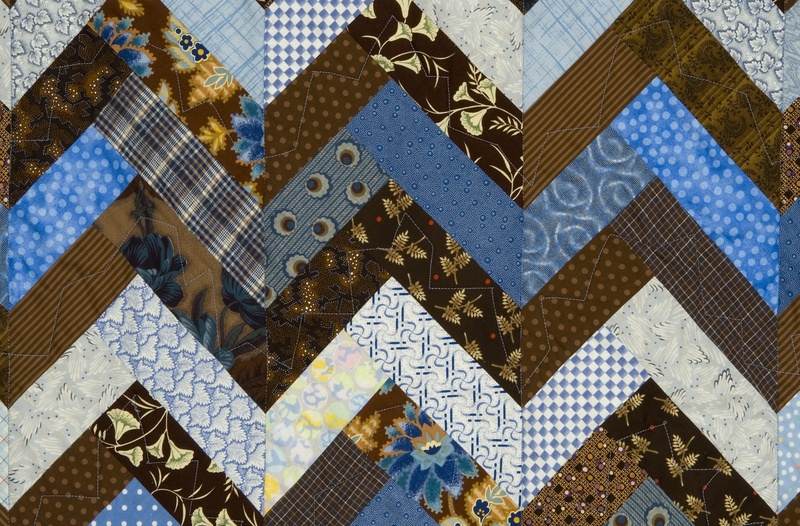 This quilt was machine-pieced, but note the hand-quilting in the detail photo. Good times!!! Shortly after making the Spool Quilt, one of the first quilts I made, having become aware of these new concepts about pattern, prints and plaids, was this one, for my son Patrick, who chose the three colors and the star pattern for this quilt. At the time I thought it quite daring of me to forgo the muslin and substitute patterned fabric. As I look at this now, it doesn’t really seem like such a jump, since the patterned fabrics almost read as solids, but this change in my way of working felt significant back then. Also significant in my personal quilting history is that this is the first quilt for which I used a rotary cutter, for making the border here. These devices are another amazing milestone for patchwork folks; what would we do without our cutters now—unthinkable!! Again, machine pieced and hand quilted. In fact, this is the last large quilt that I quilted by hand. For you, Pat. Thus endeth the ancient history lesson for today. Nearing the end of documenting my 2005-2007 project to give high school graduation quilts to all the girls in my daughter’s Piedmont Girls’ Group to help memorialize how they had stayed together since second grade, doing all sorts of projects and community service, I want to show this quilt I made for Karen Nicholls, a PGG mom and one of the fabulous ladies, along with Denise Grote, who served as leaders and were instrumental in keeping this group together for all those years. I found this wonderful pattern, Aardvark Quilts pattern Opus No. 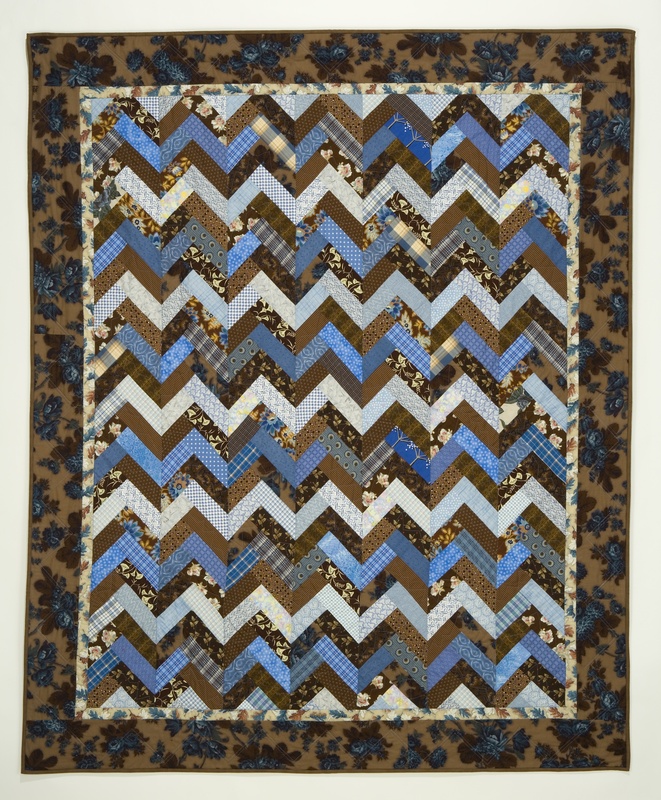 11: Zig Zag, and thought it might work for one of the grad quilts. At the time, I did not know it would turn out to be Karen’s. 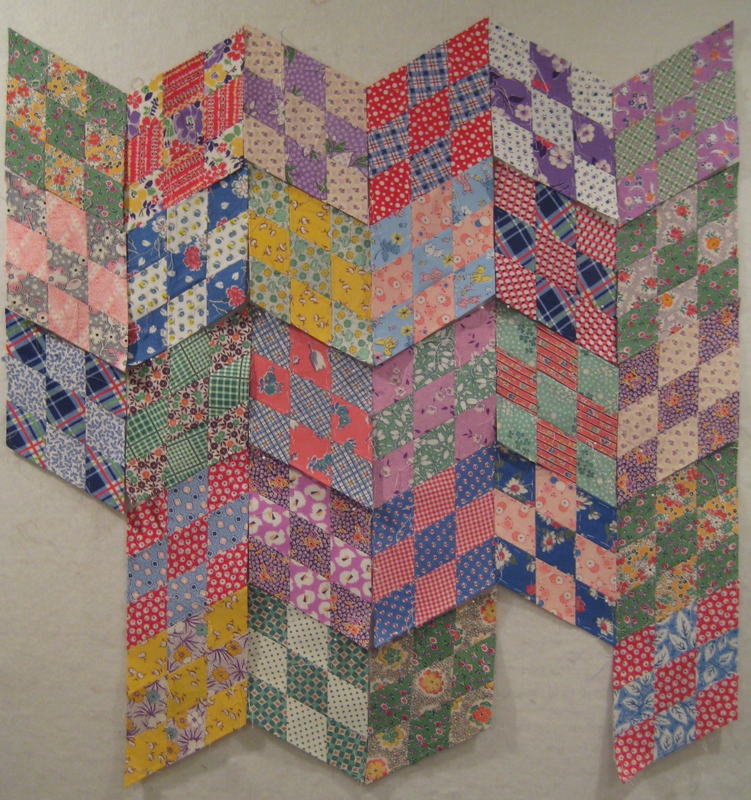 This is another example of a quilt that made itself; the fabrics all seemed to jump right onto my design wall. Lots of fun. 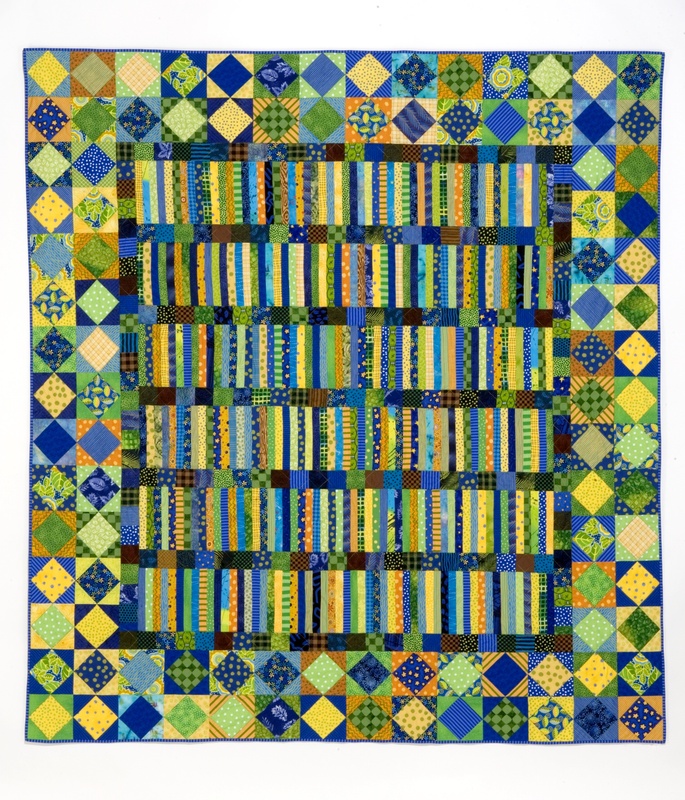 I loved creating a new (for me) quilting pattern for this quilt. It was fun to see it take shape. Click on photo to load a close-up view. Made in the wonderfully vibrant colors of bright orange and dark green, the team colors of the local rowing club Oakland Strokes, on which my daughter and Susan’s daughter rowed, this quilt was also fun to create. Since I had made a couple of raffle quilts for the Strokes, I had a large stash of oranges and greens, and it only took adding a few sock monkey fabrics to the mix to make this a totally Kim quilt. Viewer Marty suggested that I reposition my diamond units into the baby block pattern to see if I liked them better in a different configuration. I tried the baby blocks, and did not like the look, but loved the idea of moving them around. Here is the one that I liked the most, and it’s similar to the baby blocks. The diamond units seem more active and exciting here, showcasing the fabrics just a bit better, too. 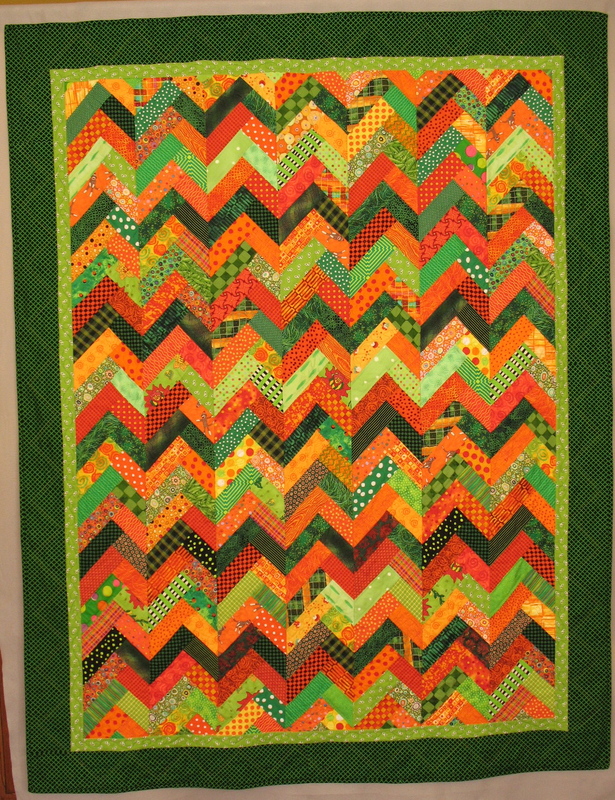 This is a placement style that I saw in an Amish quilt exhibit in the City. There may be hope for this project yet. The new configuration, however, has not yet inspired me to do any more sewing on these darlings. 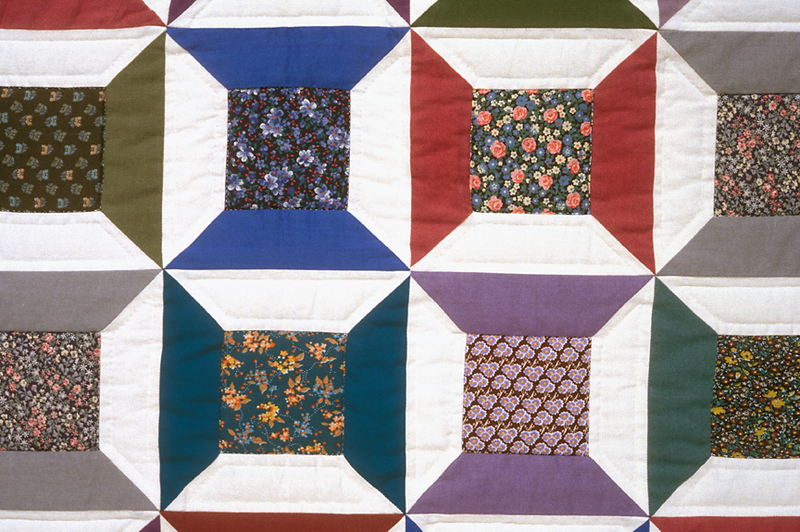 Oh, well . . . .
vintage quilts and quilt tops. Some of my very favorites of my works are based upon the quilts of these others who have come before me. 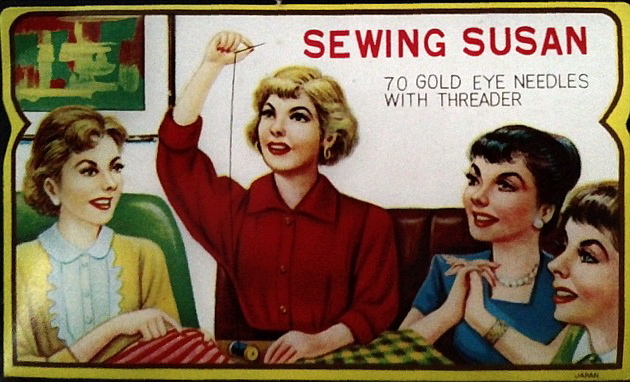 I see their efforts, and I am inspired to create my own versions, using all the wonderful fabrics available to us now. I’m sure it is because I love this design resource for my quilts that I have developed a love of the scrappy quilts, the ones that use tons and tons of different fabrics. I am currently working on two quilts that are vintage-inspired, but here are a couple that are completed. I have written about this one before, but I’ll include something new; a photo of the source quilt top. 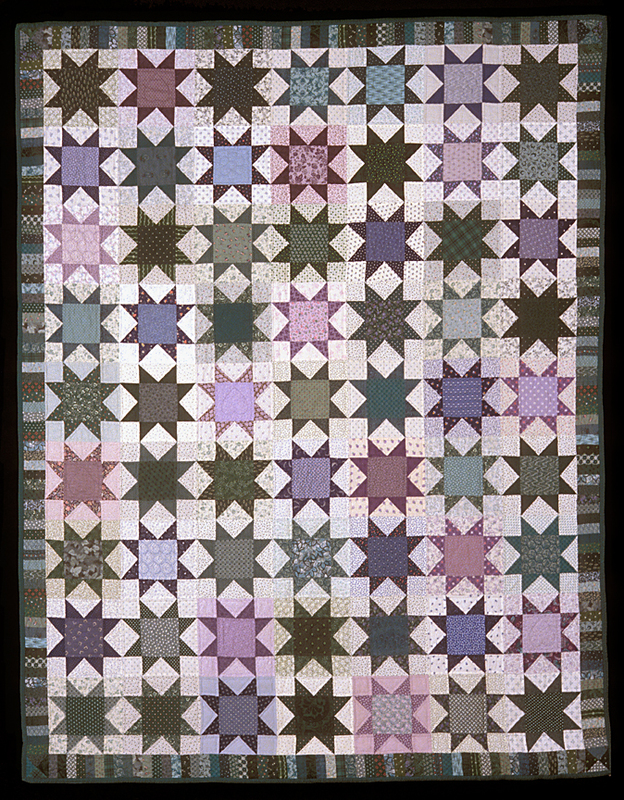 I saw this quilt during a trunk show by Gerald Roy at a meeting of East Bay Heritage Quilters in 1998. I’m grateful to Lily for the photography, since I could not do my own; those are MY little gloved hands holding the top of the quilt top, since I volunteered to be one of the “handlers” for this show. 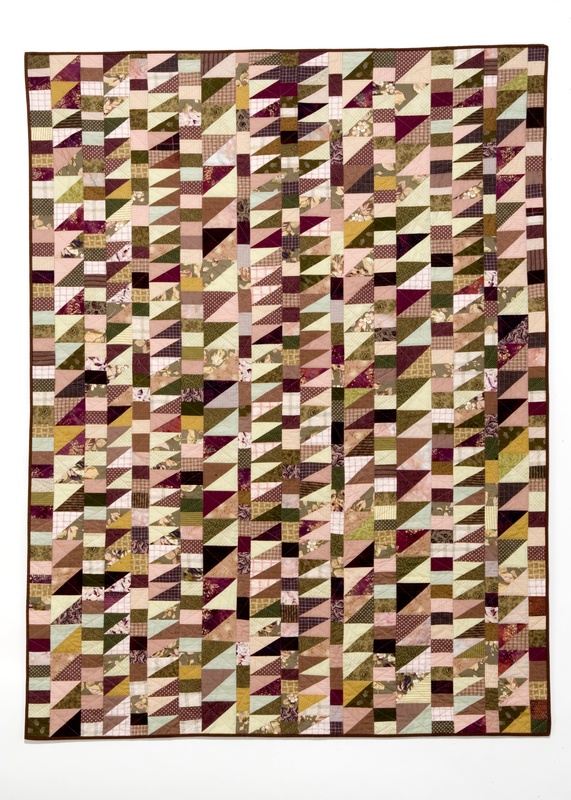 And I fell in love with this quilt top, and knew I would try to compose my own. Using a large-scale Jane Sassaman print as the color palette for my quilt, I pulled as many darks, mediums, and lights as I could find in all these wonderful colors. I have described this quilt as having “made itself” because all of these square-in-a-square blocks seemed to get finished in record time. Each time I put two fabrics together to make a block there was already another color combination I was eager to complete. Putting them all together was a joy. Although I had cut many, many squares for between and around the rows of sticks or “books”, as some viewers have told me they see, I ended up using only the darks, which seemed to work best. The inspiration for Geometry of Roses is a vintage quilt top that I found at the quilt festival in Houston quite a while ago. I had the quilt top hand-quilted by Quilting Plus, and the resulting quilt is spectacular. 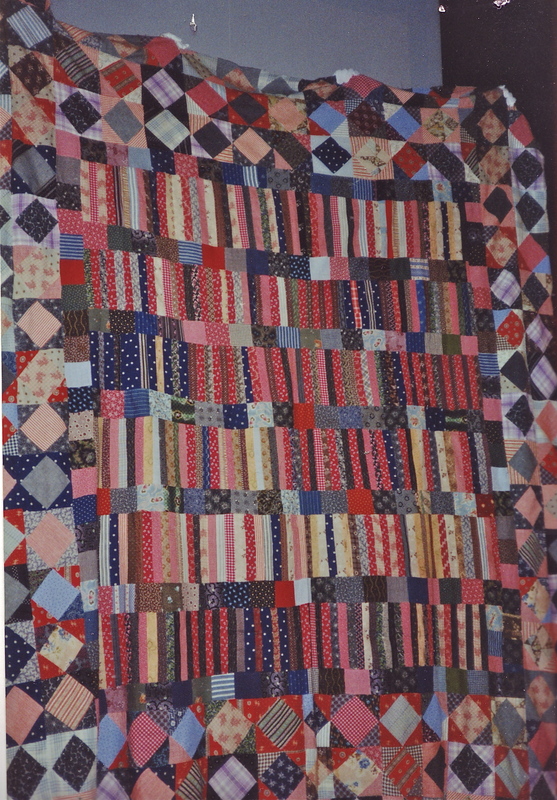 This quilt is one of the all-time favorites in my vintage collection, and it continues to sing to me any time it is displayed. Note the one triangle just below center that is pointing in the wrong direction: sweet. For my quilt I challenged myself to work in a muted palette, browns, gray-pinks, pale yellow-greens, using a dusty roses on tan floral fabric as the focus. This whole process was indeed a challenge; this quilt did not make itself, but it was a very good exercise for me and my color training. 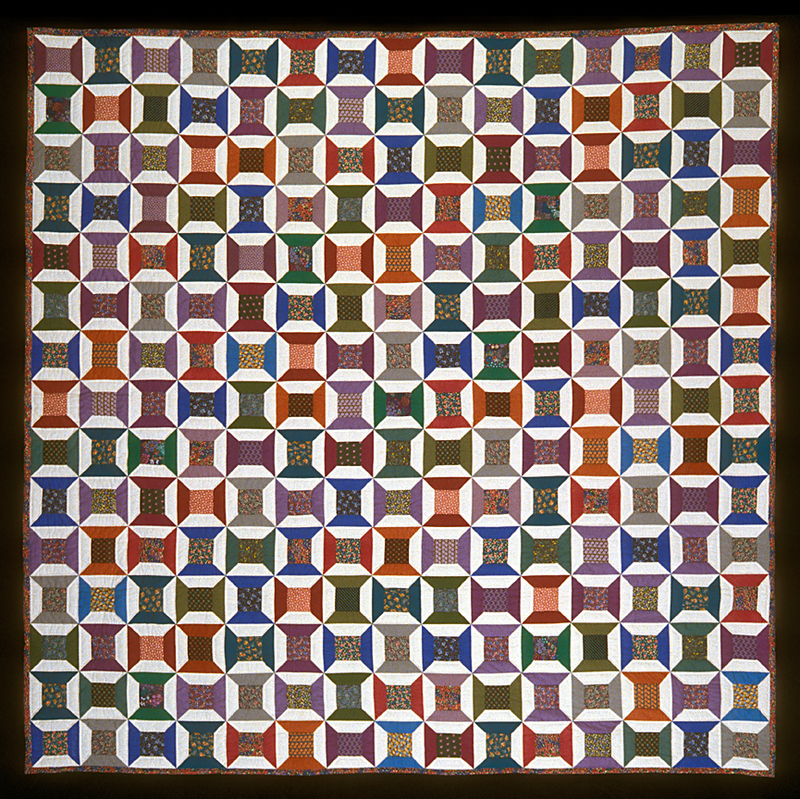 Some of the tessellated quilts in the previous post were made with 60° diamonds. And I have another, currently stalled, EPP project-in-progress using these diamonds. It has lost its momentum, and may be permanently abandoned. Who knows?? This happens sometimes, and I’m trying not to feel as though I must finish all the projects I start: too heavy a burden. Feels good to work on the ones that sing to me. These little guys are silent right now, and have been so for more than a year. I love all the vintage fabrics here, and I think I got stuck when I decided I should have put sashing of some kind between the diamond units, but it is much more likely that I just ran out of gas and started something else. A blog subscriber recently suggested that I include in this blog those items I considered “mistakes”, since we all make them and few of us celebrate them as part of our process. Perhaps this one is a mistake, but it may be too early to tell. Anyway, here it is. Also made from vintage fabrics from my collection, and also using the EPP method, this time with hexagons instead of diamonds, this quilt is a current favorite. I just kept sewing these one-patches together until it got to this size, and then threw on the borders. The border in a button pattern was the only dark print that I had enough of to be able to frame this large piece. Through this blogging process I am beginning to see the body of my work take shape. 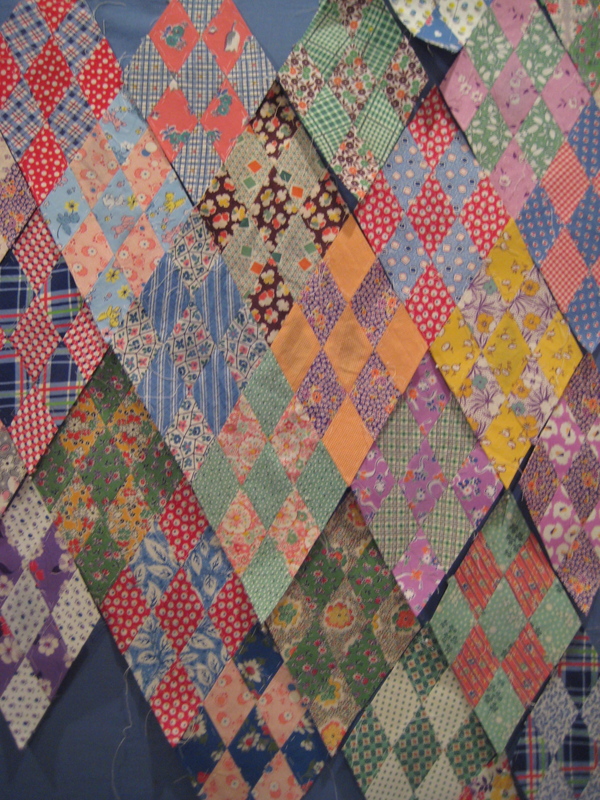 Previously it has been hard to wrap my visual brain around 215 quilts, so writing about them and showing the photos helps me do that. As it stands now, I don’t see a consistent style, and wonder if that is necessary. One of these days I may pick a style and stay with it. Until then, I’ll just keep dancing back and forth, in and around, all sorts of styles, eras, motifs, techniques, etc.—doing what I’m doing.